Although ear infections are more common in children than they are in seniors, elderly adults are still susceptible to them. Unlike ear infections that occur in children (which are often minor and clear up quickly), ear infections in seniors are typically a sign of a more serious health problem. 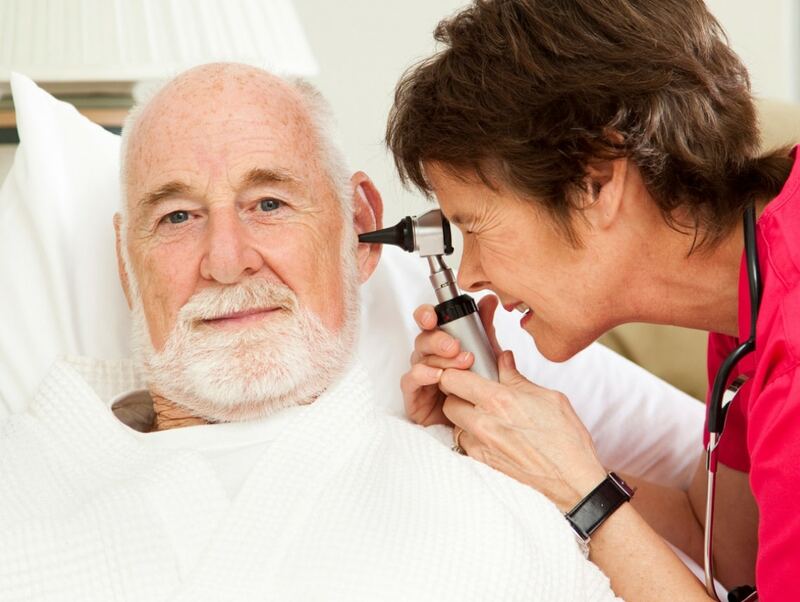 If your elder loved one has an ear infection or gets frequent ear infections, pay close attention to the symptoms and know when to contact a doctor. There are three main types of ear infections, which correspond to the three main parts of the ear: inner, middle, and outer. An infection of the inner ear may be a case of inflammation rather than an actual infection. Problems with the inner ear may also be a sign of a more serious condition including meningitis. The middle ear is located in the area directly behind the eardrum. An infection in the middle ear is also known as Otitis Media and is caused by fluid trapped behind the eardrum. A middle ear infection can cause fever as well as trouble hearing until the infection clears. The outer ear is the part of the ear extending from the eardrum to the outside of the head. An outer ear infection is known as Otitis Externa and typically starts as an itchy rash. Ear infections are typically caused by bacterial infections, but the type depends on how the infection started. For example, infection of the middle ear typically stems from a cold or other respiratory issues. The infection can move to one or both ears through the eustachian tubes which regulate air pressure inside the ear and connect to the back of the nose and throat. Infection can irritate the eustachian tubes, causing them to swell. When swelling occurs, it can impede proper drainage. The buildup of fluid within the ear puts pressure on the eardrum and causes pain. Outer ear infections, on the other hand, are often caused by water that remains in the ear after bathing or swimming, therefore outer ear infections are sometimes called swimmer’s ear. The moisture trapped in the ear becomes a breeding ground for bacteria. If your doctor suspects an ear infection, they will use an otoscope for a detailed look at the eardrum and the outer ear. This handheld device has a light and magnifying lens that allows the doctor to check the health of the ears. A Pneumatic Otoscope administers a puff of air into the ear to evaluate the eardrum’s reaction when the air is pushed up against it. This can help to diagnose an ear infection or other ear issue. Tympanometry simply evaluates how well the ear is working by testing the movement of the eardrum. A simple hearing test may also be performed to help the doctor pinpoint an infection, especially if hearing loss has occurred. People who smoke or those who are around a lot of second-hand smoke are more likely to develop ear infections. If an individual has seasonal or year-round allergies their risk of developing ear infections is higher. Ear infection treatment depends on the type and location of the infection. In most cases, antibiotics are necessary. For these types of ear infections, antibiotics are typically prescribed. Most antibiotics can be taken orally but others can be applied directly to the site of infection as ear drops. Over the counter pain relievers and anti-inflammatory drugs may also be used for pain management. If the ear infection was caused by a cold or respiratory infection, the doctor may prescribe antihistamines, decongestants, or nasal steroids. If an infection occurs in the outer ear, the area should be carefully cleaned. Once the area is clean, antimicrobial and anti-inflammatory medications can be applied. If the infection is bacterial, antibiotics will typically be prescribed. Viral infections may simply require time to heal. Most ear infections will go away on their own, so a minor earache may be nothing to worry about. However, if your elderly loved one has symptoms which don’t improve within three days, and if the symptoms include a loss of balance or a fever, see a doctor right away. Any sign of discharge coming from the ear should also be addressed by a medical professional as soon as possible. Although home remedies can’t treat or cure ear infections, they may help relieve pain and other symptoms. Apply a warm compress to the affected ear. Keep the head upright while sitting; this can help drain the ear. Gargle with salt water; this may help clear the Eustachian tubes. Manage stress; stress can worsen symptoms. Some have found that using alternative treatments like garlic oil or tea tree oil ear drops have helped to improve symptoms. Apple cider vinegar, basil, olive oil, and hydrogen peroxide may help as well, however, scientific studies do not show any of these to be effective. Clean your ears using a cotton swab. After taking a shower or swimming, be sure to completely dry your ears. Manage allergies and avoid triggers by taking your allergy medications. Thoroughly wash your hands and try to avoid people who have a cold or respiratory problem. Don’t smoke and avoid secondhand smoke whenever possible. When it comes to managing your loved one’s health, we can help. From addressing symptoms of ear infections to providing reminders for when and how to take medication, we’re here every step of the way. This can mean a more active and engaged quality of life and more peace of mind for your family.